Joe Taylor, K1JT, has announced the release of version 1.7 of the popular WSJT-X software package. WSJT-X implements digital communication protocols or “modes” called JT4, JT9, JT65, QRA64, ISCAT, MSK144, and WSPR, as well as one called Echo for detecting and measuring your own radio signals reflected from the Moon. These modes were all designed for making reliable, confirmed QSOs under extreme weak-signal conditions. This is a major update of WSJT-X, featuring several new modes including modes: ISCAT, MSK144 and QRA64 as well as many other performance enhancements, support for additional radios, a new and improved user guide and many other features. Complete release notes are available here, or at the bottom of this post. WSJT-X is a complex program. Be sure to read the online WSJT-X User Guide for Version 1.7. 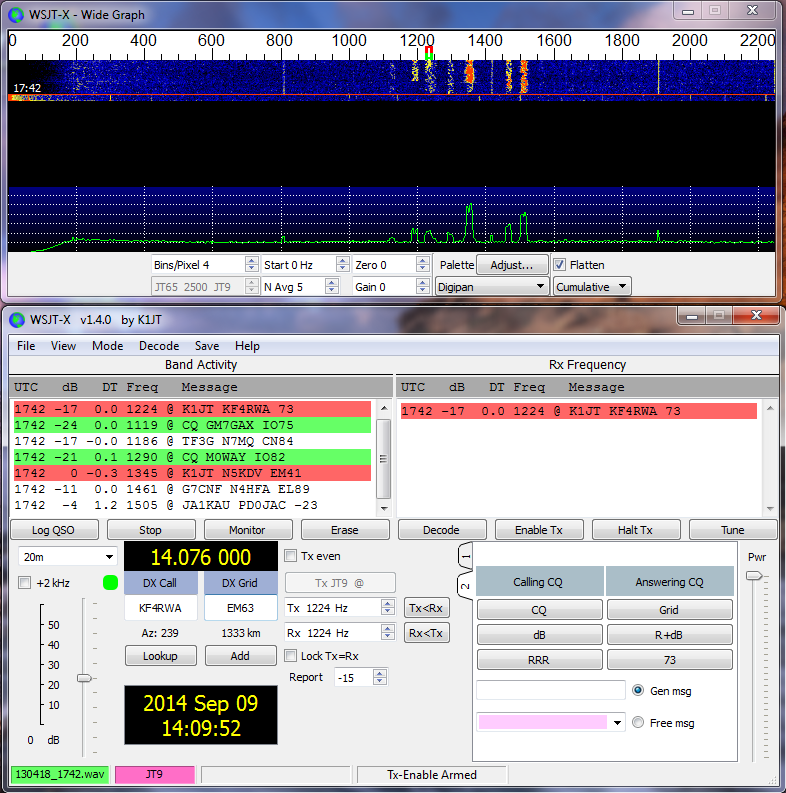 WSTJ-X v1.7 is a free download and is available from the WSJT-X website here. Copyright 2001 - 2016 by Joe Taylor, K1JT. 1. New modes: ISCAT, MSK144, QRA64. 2. Newly implemented submodes: JT65B-C, JT9B-H (wide and fast). 3. FT decoder replaces KV decoder for JT65; KVASD is no longer used. 4. Improvements to JT4, JT9, and JT65 decoders. 5. Multi-pass decoding now implemented for JT65 as well as WSPR. 6. Many improvements to Rig Control. 7. Improved convenience features for EME Doppler tracking. 8. Multiple configurations can be saved and restored. 10. Optional auto-sequencing for Fast modes. 11. Contest Mode for MSK144. 13. WSJT-X User Guide enhanced and extended in many ways. JT9, JT65, and QRA64, MSK144 uses strong forward error correction. and you will see little or no garbage on your screen. of the two callsigns along with a report, acknowledgement, or 73.
will not be able to decode its Sh messages. signal reports in ths standard QSO exchange. and your QSO partner is 200 Hz, and less is better. tone frequency. This change yields another 1.9 dB advantage. "Enable VHF/UHF/Microwave features" on the Settings | General tab. For MSK144 mode, we suggest setting "T/R 15 s" and "F Tol 100 Hz". (600 Hz for submode E). complete recipe to reproduce it. Feature requests are also welcome. I am running Sierra on a 8gig mac and I am getting “Unable to create shared memory segment” when starting the app. I have exactly seem problem… can’t fix on myself.. Tried to load software on my MAC …no luck with opening it ..Error …Could not share memory.. what gives? Tried it with two different computers with different OS..10.12.1 & 10.11.6 any one have a FIX???? Replaced 1.6 which runs on my Mac with Sierra. 1.7 opens but does not like the config settings I use with 1.6. I get an error which says: Hamlib error: Invalid parameter while setting frequency. When I “Test CAT” I get the error: “Rig Failure. Hamlib error: Invalid parameter while setting frequency.